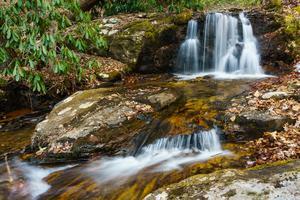 The Shope Creek watershed area is relatively new on the list of places you can visit in Pisgah National Forest. 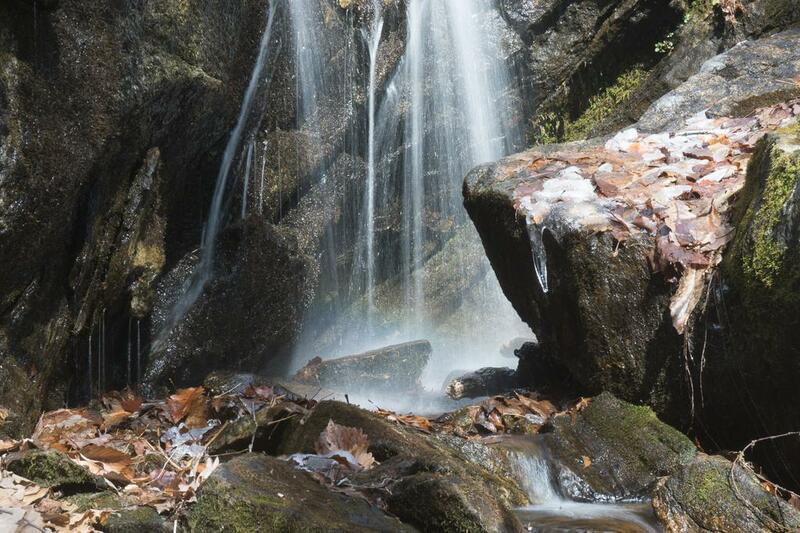 It's the only publicly owned tract of land in the forest that dips south of the Blue Ridge Parkway in the Craggy Mountains northwest of Asheville, NC. Before a logging project took place in the bottom of the valley, at which point a public parking area was built and the gate which used to block the entrance road was removed, very few people got the chance to hike and explore here. In the few years since, it has become a rather popular place to visit indeed. 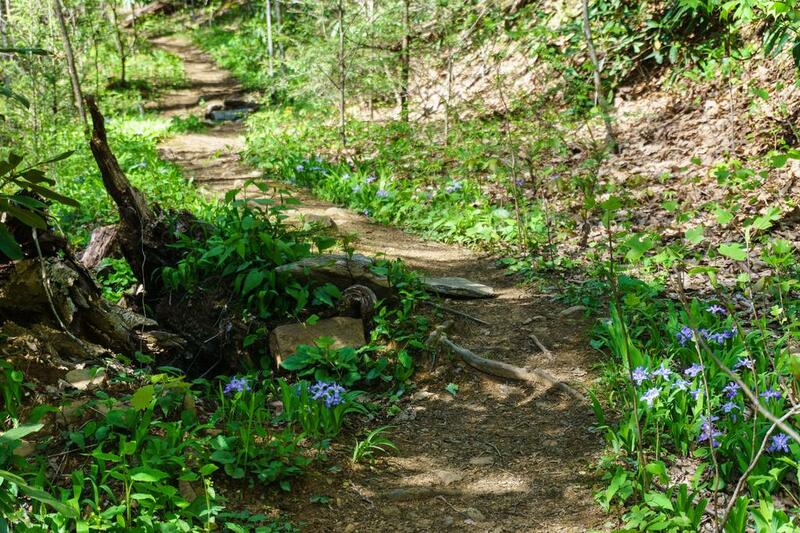 This trail in the Shope Creek area, unofficially called "Crested Iris" provides a nice hike with its eponymous wildflowers blooming in mid spring. This old logging road has reverted to a trail through a nice section of forest in Shope Creek. 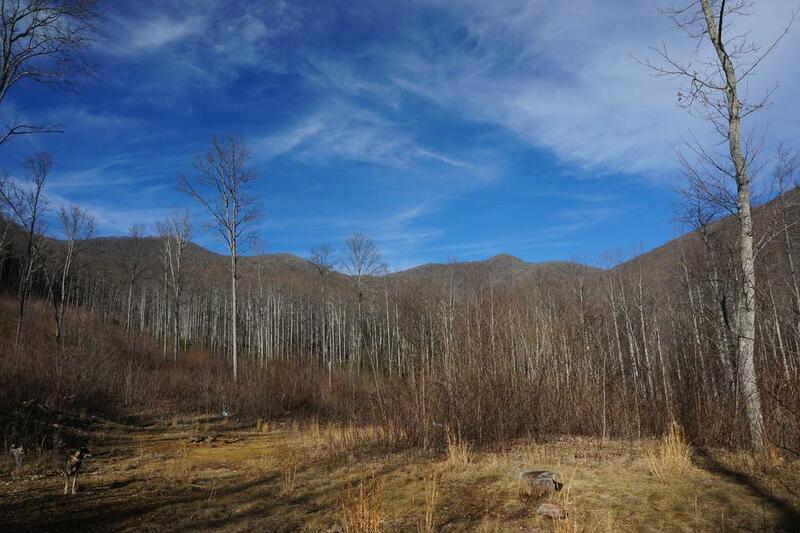 Though the area is small, at only about 1700 acres, it's possible to hike for several miles on cleared trails. Beautiful forests, cascading streams, small waterfalls, and some cliff-top views round off the attractions that can be found in this little gem of an area located very close to the City of Asheville. 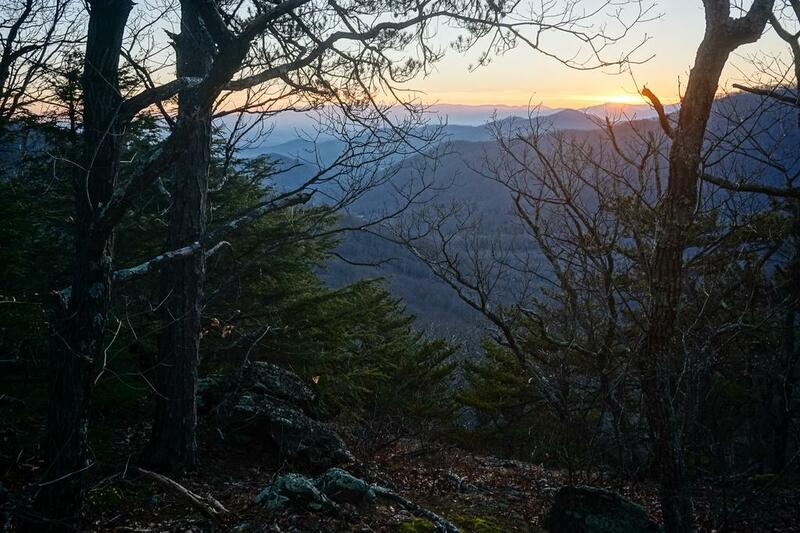 With elevations ranging from around 2700 ft to 5230 ft on Lane Pinnacle, the area has over a half-mile of elevation change and a surprisingly diverse and robust ecosystem. In years past, with no public parking, the Shope Creek area was only accessible to those willing to travel Shope Creek Road on foot or bicycle, or to find someone to drop you off at the entrance to the forest. Intrepid explorers could have come down the mountain from the Blue Ridge Parkway, perhaps. But very persistent landowners at the entrance to the Forest Service road ensured that no parking was possible anywhere near the area. But in early 2007, the Forest Service - in preparation for a logging project to improve timber and wildlife in the area - recognized the need to allow reasonable non-motorized public access to this section of the forest. Public access to the forest became a (controversial) part of the Shope Creek Project, and public hearings were held get feedback before an Environmental Assessment (EA) was developed and an alternative project plan was chosen. 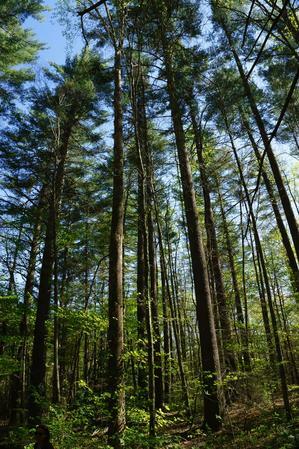 Despite somewhat vigorous opposition from property owners, who believed crime would become a problem if the area were opened, and some resulting trepidation from the Forest Service, the public access component remained a part of the final plan. The logging project was completed in 2012 and the parking lot was opened. 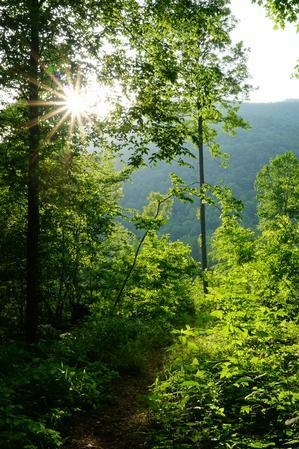 Afternoon sun shines into a forest clearing in the Shope Creek area. This clearing was created during a recent logging project, and was designed to open up early successionl habitat in the forest. A small trail network is in place in the area, starting at the new parking lot. The official routes in the area include only two small sections of Forest Service roads, perhaps enough for 30 minutes of hiking at a good pace. Most trails you'll find in the area, however, are "unofficial" ones that follow old abandoned logging roads or are newly forged. Despite their unofficial status, they are by now well-established and easy to follow, albeit without any signs or blazes. Many are shown on Forest Service maps of the logging project. These add up to several miles worth of trail, making as much as a full-day outing feasible. Starting at the parking area, there are three main routes you can follow - two of them are officially available for use and the rest are considered "non-system" trails. The most obvious option, and an official Forest Service route, is FS 220, or the main "Shope Creek" trail, located behind the gate and going uphill along Shope Creek through a grove of white pine trees. This grassy old road splits in about 250 yards; FS 220 goes the right ("Warbler Cove" trail) to cross the creek on a concrete ford and continues gently uphill around a curve to a dead-end (officially). If you take the left at the fork, you'll be on FS 220A ("Shope Creek" trail), which climbs a little further to a flat spot in a new forest clearing with a nice view. But those are just two of the options available in the area. To explore further, you'll have to go off the official forest roads onto one of the many old logging roads and unofficial trails which have sprung up in the area. We don't normally endorse using unofficial trails. 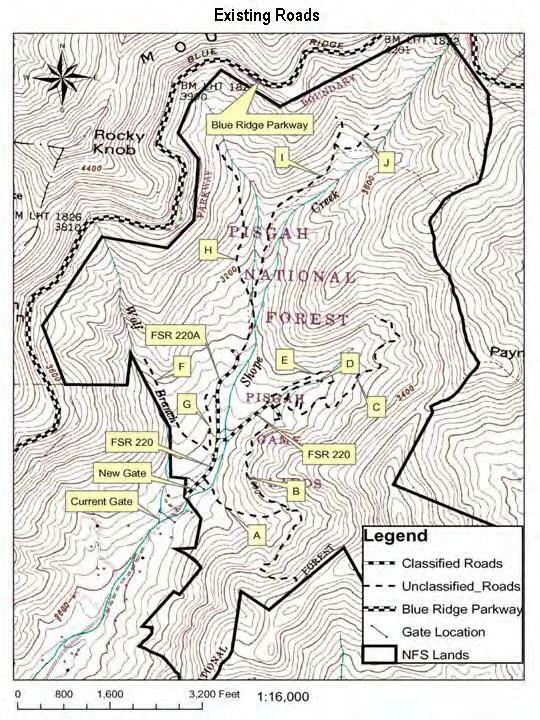 However, beyond the two short forest roads mentioned above, the Forest Service hasn't designated any trails, and so there isn't any way to get to the more interesting parts of the Shope Creek valley without using them. So until such time that these trails are officially closed, we'll have to make an exception here. We'll use the FS Map above as a basis to refer to roads and/or trails in the descriptions below where possible. Some aren't on that map. Starting at the upper end of the parking lot, the "Wolf Branch trail" (FS Map "F") leads uphill through the young forest in the logged area on a gentle grade beside Wolf Branch. It enters a section of older forest and a junction with another trail ("Pine Forest Traverse") leading right. Beyond that junction, Wolf Branch trail climbs into another young cut-over area where it becomes overgrown, peters out, and ends. A foot path continues up beside Wolf Branch to Casita Falls, a tiny cascade and slide, but one maybe worth visiting if the water is high. There are a few small waterfalls in Shope Creek. The "Pine Forest Traverse" trail leads northeast back to FS 220A ("Shope Creek trail") on a generally level course below the steepest part of the mountain, making a neat loop option. This stretch passes through open woods and has a couple of tiny stream crossings. Clearing at the end of FS 220A. Back at the parking area, if you walk around the gate and then turn right, you'll find the "Fairy House" trail (FS Map "A"). This trail crosses Shope Creek at a spot where crossing can be tricky when the water is high, before climbing through another logging clearing with some nice views back toward the Blue Ridge Parkway and High Swan (mountain) near its upper end. The trail re-enters the woods, passes a small dugout in the roots at the base of a tree which lends its name, and continues on a moderately steep climb that is getting a bit eroded near the top. 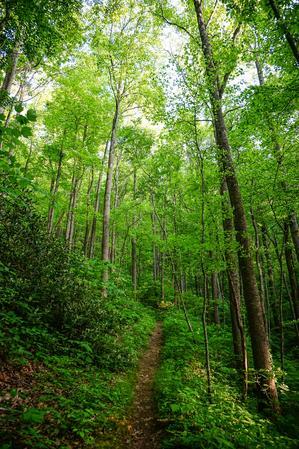 The trail passes through a nice hardwood forest filled with Spicebush, which blooms bright yellow in early spring. It ends at a junction with "Warbler Cove trail (FS Map "B"). 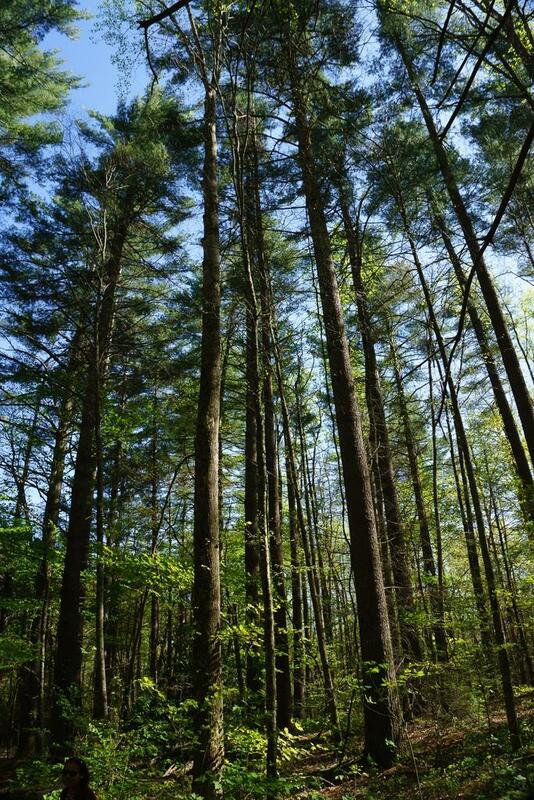 A group of tall white pine trees grows in the Shope Creek area of PIsgah National Forest, seen here in mid spring. "Warbler Cove" trail (FS Map "B") actually starts at the end of FS 220 in a clearing, so turning left at the top of Fairy House provides a loop option using that route. If you turn right, uphill, the old road/trail continues climbing the mountainside through a nice forest of tall trees until it reaches a series of switchbacks to the left. The trail narrows and climbs steeply in a beautiful cove often filled with songbirds. It eventually climbs all the way to the ridgeline (at a section of private property) to a junction with the Rock Payne trail (see below). At the end of FS 220, and the junction with "Warbler Cove" trail (FS Map "B") another trail swings left - "Twisted Vine" (FS Map "C"). This one forms a loop as it winds partway up the mountain, then descends in a cove to pick up another old road (FS Map "D") to close the loop. On the other side of the valley, "Forrest Falls" trail (bottom part of FS Map "I") peels off FS 220A (Shope Creek trail) to cross the major tributary of Shope Creek and climb alongside it. A junction with a connector across the creek is reached on the right; bear left, uphill, to stay on Forrest Falls trail. In short order, Forrest Falls trail follows another old road to the right (not shown on the Forest Service map) and crosses Shope Creek above a small but pretty waterfall named Forrest Falls. Beyond the falls, "Crested Iris" trail, which is a single-track path, leads downhill all the way back to FS 220 (Warbler Cove trail), forming another nice loop option. The "Thalweg" trail leads left, uphill, to eventually reach the upper end of a couple more old logging roads (the middle of FS Map I and J), making another loop. Both of these trails on the east side of Shope Creek are nice, scenic alternatives to the rather boring old logging roads which - although officially on the map - climb through a mundane, young forest on the creek's west side. From the end of Wolfden Flats, the steep "Mule's Face" trail (one of those rare trails that are actually shown on the old USGS topo maps!) leads straight up the slope to a gap in the ridge below the Blue Ridge Parkway and Lane Pinnacle. The "Rock Payne" trail follows the ridgeline from the Blue Ridge Parkway, south through this gap, across an unnamed knob, across Paynes Knob, then across Rock Knob, then to a junction at the end of Warbler Cove trail mentioned above. Wonderful cliff-top views appear along the trail near Paynes and Rock Knobs. 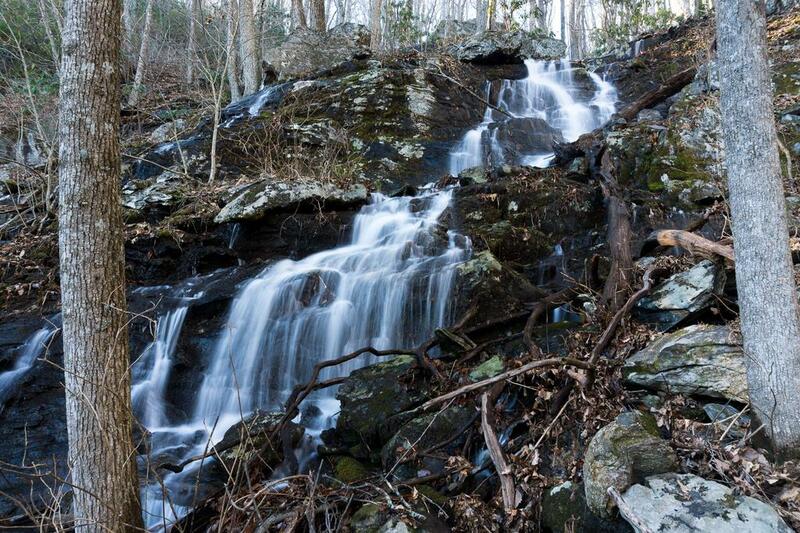 A longer loop using the trails along Shope Creek and the Knobs Trail can be made. Although it is in surprisingly good shape, this one can be a bit harder to follow in the growing season and is much more difficult than the other trails in the area due to its steepness in places. The very top of the road labeled "I" on the Forest Service map leads to a point near the base of Wolfden Falls. All names shown here are unofficial, used only for disambiguation, and subject to change. Shope Creek is designated as a day-use only area, so no camping is allowed. Parking is allowed only during the daytime. 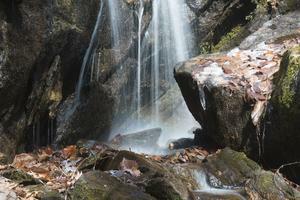 Camping is available at nearby public and private facilities near the city of Asheville, however. Lodging is available in the nearby cities of Asheville, Swannanoa, and Black Mountain. From downtown Asheville, take I-240 East 1.7 miles to Exit 7, US-70/Tunnel Rd. East. Take 70 East for 2 miles to Riceville Road and turn left (at the Ingles supermarket & shopping center). Follow Riceville Road for 3.7 miles and turn left onto Bull Creek Road. Bear right almost immediately onto Shope Creek Road. Go 2.3 miles to the end of Shope Creek Road; the road will cross Shope Creek on a concrete low-water bridge and turn to gravel. The parking area, which is signed, is about 0.1 mi. ahead on the left.